This is a select group of students interested in a variety of musical styles and simple choreography. STUDENTS MUST AUDITION FOR ADMITTANCE. This group performs most often outside of the school at social or charity functions as entertainment. The group may also participate in solo and ensemble contest as well as large group contests—District and State. Participation in all performances is mandatory. Participation in Concert Choir, Women’s Chorus, or Men’s Chorus is mandatory (schedule permitting). Some after-school rehearsals are required. Apparel expenses are involved. This group of students performs a variety of choral literatures. These students also perform for many school and community activities during the school year. In addition, the choir may participate in large group contests—District and State. Participation in all performances is mandatory. Some after-school rehearsals are required. Apparel expenses are involved. The Concert Orchestra is a select performance group. Repertoire includes a variety of compositions including OMEA class A literature. Required weekly sectional rehearsals are part of the curriculum. Participation in all performances is mandatory. Solo and Ensemble adjudicated events are available to members of the group. Private instruction is strongly recommended. Prerequisite: audition and permission of the director. The Reynoldsburg Raider Marching Pride is one of the premier marching ensembles in the state of Ohio. Performances may include parades, football games and competitions. Must be a member of Freshman Band, Symphonic Band or Wind Symphony AND/OR by permission of the director. The Prelude Orchestra consists of students who play the violin, viola, cello, or bass. Students learn and perform music from the Renaissance to Modern periods of music. This group will play literature in the OMEA class C-B-A categories. Required weekly sectional rehearsals are part of the curriculum. Participation in all performances is mandatory. Solo and Ensemble adjudicated events are available to members of this group. Private instruction is strongly recommended. Prerequisite: permission of the director. The Reynoldsburg High School Symphonic Band studies and performs OMEA Class C-B (Grade 3-31/2) wind band literature. Repertoire includes a variety of compositions composed or arranged for the intermediate high school wind band. Performances include three yearly concerts and may include OMEA Large Group Contest at the discretion of the director. Attendance at all performances and rehearsals is mandatory. Private instruction is strongly recommended. Prerequisite: Freshman band or equivalent AND permission of director. The Reynoldsburg High School Wind Symphony studies and performs OMEA Class A-AA (Grade 4-5) wind band literature. Repertoire includes a variety of compositions composed or arranged for the advanced high school or college wind band. Performances include three yearly concerts and may include OMEA Large Group Contest at the discretion of the director. Attendance at all performances and rehearsals is mandatory. Private instruction is strongly recommended. Prerequisite: Freshman band with an “A” AND permission of director. 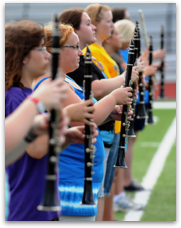 Parent booster groups help sustain bands, orchestra and vocal programs through dedicated fundraising and volunteerism. Watch for opportunities to support young Reynoldsburg musicians yearround at local restaurant partners and community events.